The Alumni Association's Award for Distinguished Achievement is chosen each year by the Alumni Council, on behalf of the Alumni Association, in order to honor a graduate who exemplifies distinguished achievement in his or her chosen profession or accomplishments. 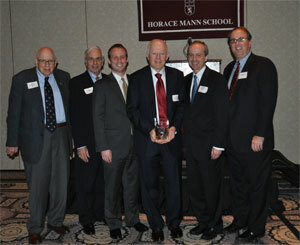 The first award was bestowed to a graduate of Horace Mann in 1939 and it has since become a well-recognized and anticipated event and honor every year. Among our award winners are Pulitzer Prize winners, artists, poets, writers, scientists, entertainers, inventors, lawyers, judges, and many more outstanding individuals. To see more information on our winners, use the links below.